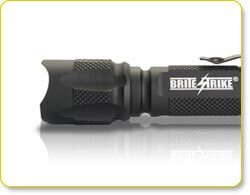 Designed by police officers for police officers, the Brite Strike Two-Cell LED Flashlight is part of Brite Strike's Blue Dot series. The flashlight is packed with features that law enforcement, military, and security personnel can rely on, including powerful light output, a wide beam, long run times, durable construction, an ergonomic grip, easy operation, and more. Durable two-cell LED flashlight is designed especially for law enforcement. View larger. Tactical Touch switch design allows you to turn on the flashlight or switch modes with the touch of a finger. View larger. Specially designed for police officers, the Brite Strike Blue Dot Two-Cell LED Flashlight provides brilliant white light at up to 310 lumens. Its wide spread creates a flood effect that's large enough to illuminate the entire area in and around a vehicle. This Blue Dot flashlight offers extended run times, so you have light for as long as you need it. It runs for two and a half hours on the Hi setting, four and a half hours on Lo, and three hours on the Strobe setting. Ready for action under even the harshest, most hostile conditions, this flashlight is CNC machine milled from a single billet of high-grade aerospace aluminum. Its proprietary black anodized casing is waterproof and shockproof. The casing exceeds Mil Spec Class Two Type III specifications, which means it offers optimum protection against the elements and won't chip, flake, or crack. For optimum control and comfort, this flashlight has a tri-sided body that offers an ergonomic grip. The patented HLS (Hi/Lo/Strobe) Tactical Touch switch design allows you to turn on the light or switch modes with the touch of a finger. To prevent light failure, the switch utilizes six-chip digital power management technology. Additionally, the switch is slightly recessed within the flashlight's crenellated crown for protection against damage. Designed for use by law enforcement personnel, this Blue Dot flashlight has a blunt crenellated strike crown on the front and an aggressive crown on the rear for maximum effectiveness during pressure point control applications. For fast draws, the pocket clip is reversed to offer optimum clearance from pockets, belts, or pants. The clip can also be easily attached to an epaulet. The Brite Strike Two-Cell LED Flashlight is backed by a one-year warranty. 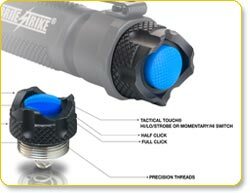 About Brite Strike Technology, Inc.
Two police officers started Brite Strike Technology, Inc. with the goal of creating tactical flashlights that offer all the features law enforcement officers and ordinary citizens need to stay safe. The company now makes tactical flashlights--with quality components and the latest in LED and DPM (digital power management) technologies--that stand up to the everyday demands of police work. Two-Cell LED Flashlight, and two 123A lithium batteries. If you have any questions about this product by Brite Strike, contact us by completing and submitting the form below. If you are looking for a specif part number, please include it with your message.